Rowing BC, with support from the Vernon Rowing and Dragon Boating Club, will be hosting a U19 Development Camp at Swan Lake May 4-5, 2019. This camp is intended for U19 athletes interested in experiencing a performance development camp. It is an ideal training opportunity for athletes from Zone 1 (Kootenays), 2 (Thompson-Okanagan), 7 (North West) and 8 (Cariboo-North East) with goals of attending the 2020 BC Summer Games. 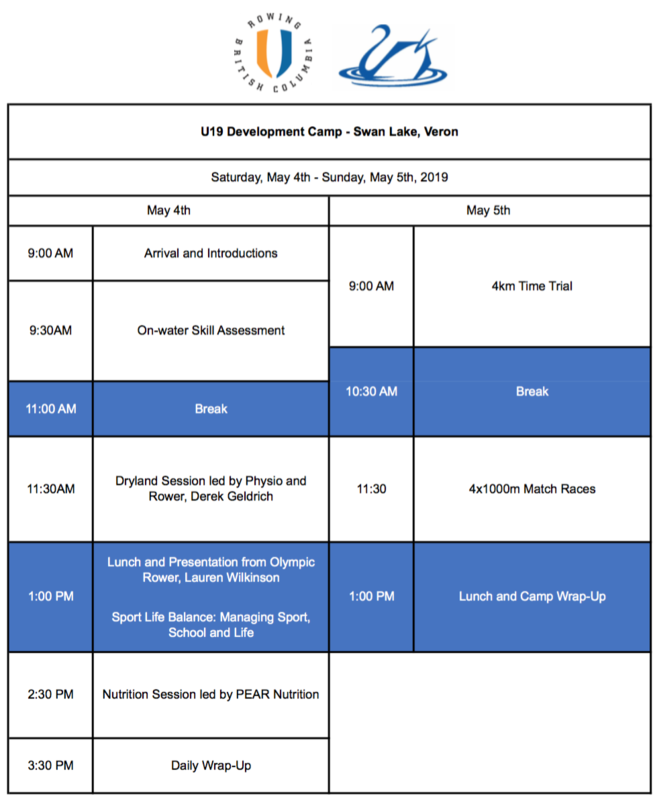 This camp will include on-water sessions coached by Rowing BC’s Provincial Coach, Rob Richards, as well as an athlete nutrition session led by Vernon’s P.E.A.R Nutrition, dryland training led by physio and rower, Derek Geldrich, and a special talk from Olympic rower, Lauren Wilkinson. It is an opportunity to be challenged in a slightly different way than daily club-based training, and connect with athletes from the wider area who are striving for similar goals. Participants should be comfortable (not an expert, but comfortable) in a racing single. Home club coaches are expected to help arrange access and transportation for singles for their athletes to use at this camp. Martin George is available to help coordinate these arrangements. Registration will be limited to the first 20 participants to sign up and complete their payment. Additional registrants will be placed on a waitlist and notified if space becomes available. Athletes are responsible for their own travel and accommodation arrangements. Payment of $60 can be made by cheque mailed to Rowing BC (155-3820 Cessna Drive, Richmond, BC, V7B 0A2) or by e-transfer to admin@rowingbc.ca. For more information, contact Rowing BC Provincial Coach, Rob Richards (rob.richards@rowingbc.ca).